I love this mayonnaise-free version of potato salad. It makes a great potluck or picnic dish. will definitely be trying this one very soon! thank u! 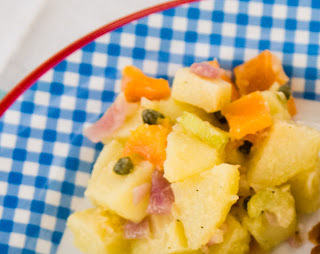 This recipe looks a lot like German potato salad, which I love! I'll have to give this one a try. Very bookmarkable. There's a vegan restaurant down the block from me that serves the MOST delightful vegan potato salad. They use more mustard in their recipe but I think this comes as close to their mouth watering stuff. Looks delicious, thank you. I will give it a try. Iron Chef, I clicked your link and it has nothing to do with the reason I come to this blog which is vegan food. All of your recipes use eggs, milk, meat, cheese. I like this mayonnaise free version of potato salad. This dish looks so beautiful. This does sound delicious! Will try it out soon. Thanks so much for sharing. This looks and sounds wonderful - thank you for posting the alternative!! !